hall monitoring, Oy, what rock did you come from under? Right off the bat I was cutoff by a guy for the scanner at security. Frankly, I expect better from the Pre Check lane but I was proven wrong. With two lanes merging, I was about to get behind the woman from the opposite line when an enormous man stepped right in front of me. He knew he cut me off and didn’t make eye contact as he literally threw his weight around to get one body length ahead of me. When he was randomly chosen for a pat-down five seconds later, I gave him the biggest, sweetest smile and told him to have a nice day. At the Surdyk’s check-out, the woman in front of me loudly demanded to know if the crackers in her snack box were gluten free. Now, the box actually said the crackers were indeed gluten free (as pointed out to her by the cashier), but she “just wanted to check”. Then, “just to be sure”, she made the cashier re-pack the box anyway. She turned to me and said, “Sorry, I just really can’t tolerate gluten, you know?” “No, I’m pro-gluten,” I replied. Man: @#*&$ @#$&! And now I’ve scalded my hand! Can I get some ice for my hand?! Man: (As the barista is making the new tea) And why isn’t there any milk out here? Barista: I’m sorry, we don’t keep milk out. Man: Who would want tea without milk?! Can you make me a chamomile with milk, please? Man: Do you have whole? Man: Well then I guess that will have to be ok then, won’t it? Yikes. Granted, I wouldn’t be very charming if I had just scalded my hand either but he was rapidly deteriorating and I could not look away. He then went on to list all the things wrong with their tea setup (the honey was nearly out, again there was no milk, there were no extra lids). He did glance over at one point and we locked eyes for a second. I’m pretty sure the look on my face was something akin to “Sorry you hurt yourself but you have got to get a grip and stop yelling at the 19 year-old making you tea with milk”. He looked away and then stormed off when his tea with second-rate milk was ready. Looks like another magical year of air travel is ahead of me! Flying, I’ve found, is nothing but a very complex game. And, as a textbook firstborn, I prefer to play games I can master–and win. Alas, where there is always a ladder to a faster, better way around things, there is also a chute that will slow your progress completely. Also much like a game, there’s always a way to cheat. Some cheat moves are fairer than others (like cutting the security line with a status card), some are all right when necessary (jostling seats to accommodate a family that has been separated), and some are reprehensible. Like boarding outside your zone. For those of us that spend a fair amount of time flying, the little perks accumulated that allow for sanctioned cheats start to mean everything. Especially early boarding (which in this super fun metaphor, would be a ladder). So when someone tries to get around this rule, whether by cunning or stupidity, I get stabby. 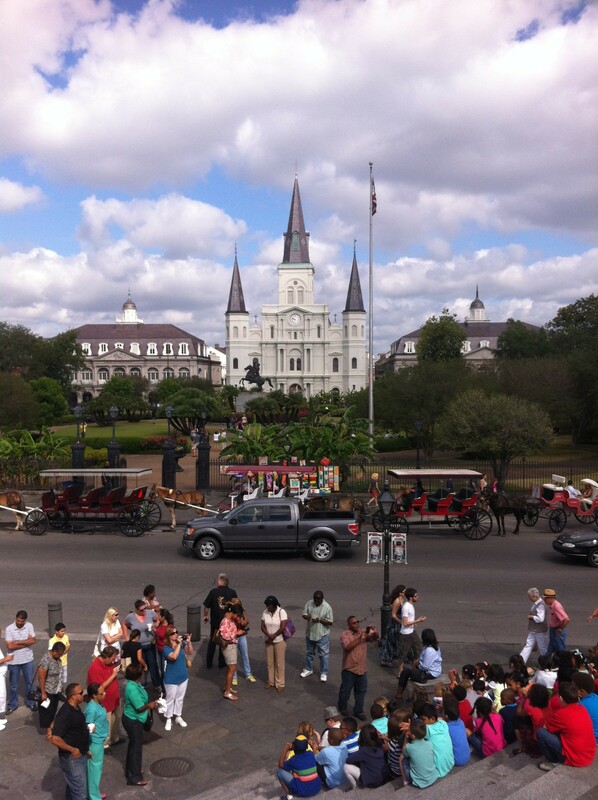 On my way to New Orleans last week (E had a conference and I decided to tag along and get in some shopping and eating in a new city), there was just such an example. As with most of the flights I’m on, the flight to New Orleans was delayed. I find that this fact seems to up the quotient of people (especially those with status) not only cheating at boarding, but feeling completely justified in doing so. As if their ‘time served’ in the boarding area entitles them to board whenever the F they feel like it. What’s even more annoying than this fact is that they usually get away with it. There’s nothing more a dedicated rule-follower loathes than someone who breaks the rules without consequence. It’s hard being so virtuous. But I digress. Back to C25. A half hour late, we began boarding. I had been “vulturing”, as E and I have coined it, on the boarding lane since it became clear that Lenny, the gate agent, would be moving us all through as fast as possible. After pre-boarding some delightful old Russian ladies, he called for First Class and all of the vultures took an unconscious step forward. I had noticed a pair of Diamond fliers off to the right of the boarding lane since I’d started my hover and now I saw that they were inching closer to the scanner, presumably to sneak on with the First Class cabin. As noted, I see this happen all the time. Should I be so worked up about it? Probably not. But it’s the principle of the thing. 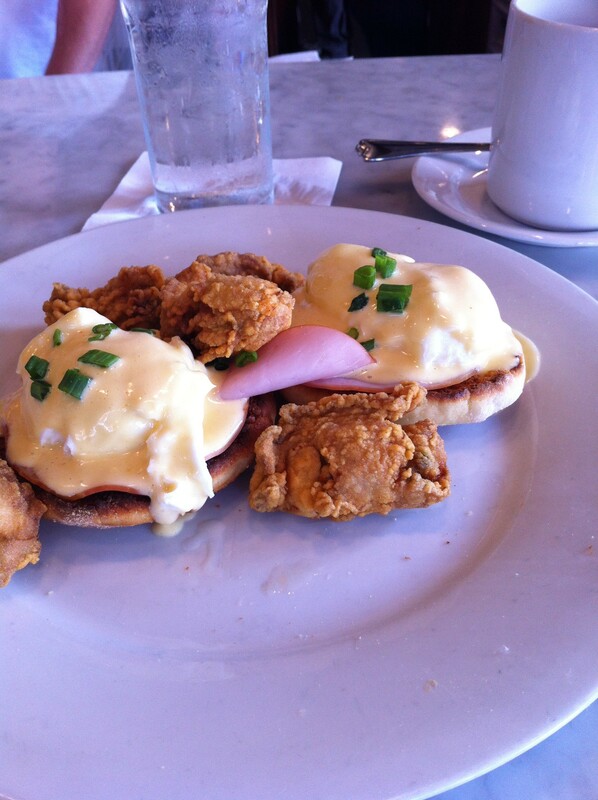 Eggs Benedict with fried oysters? Sure, why not? Luckily, much like Roger from the other week, Lenny was ON. IT. As they shiftily sidled up to the scanner, Lenny asked them if they were First Class. When they admitted they weren’t, he asked them to slide down the chute and wait for the Sky Priority Zone to be called. After they only shuffled a step back, he asked them to remove themselves all the way off the boarding carpet. I chipped in by giving them the Stink Eye to let them know their hijinks hadn’t gone unnoticed. It was awesome. Although I realize the Lennys of the world are few and far between, it was a nice win for the Rule Followers and the perfect start to a long weekend of shopping, eating, and Jazz Fest-ing. I am nothing if not a serious observer of my surroundings (sidebar: my parents used to call me The Hall Monitor of Life because of my intense scrutiny and cataloging of those around me). I am completely fascinated (and sometimes horrified/annoyed) at how people react when their options are limited. Clearly, an airport is an amazing place to observe human nature…everyone is captive and forced to make due with the resources at hand. On my flight home from a whirlwind weekend with my college girlfriends in Boston, my interest was piqued by my neighbor, a young woman who had the center seat to my left. She got on the plane very late, but came from the back of it, as though she had gotten all the way down the center aisle only to realize she was sitting in 10E and not 30E. I didn’t think much of her at first (although I was really amused by her actually reading the safety card. I do usually glance at the emergency door if I’m in an exit row so that I won’t embarrass myself if I actually have to save lives, but I can’t recall the last time I’ve looked at the actual overview. I mentally applauded her effort.) and swiftly partook in my usual pre-takeoff nap. Once awakened by the 10,000 foot bell going off, I took out my iPad and fired it up. My neighbor took out her laptop and started it up as well and this was where things got more interesting–at least from an anthropological perspective. As you can probably tell (from my last post alone), I’m over-prepared for every occasion. (I even have two sets of headphones in my carry-on in case one gets misplaced. God forbid I can’t hear Jack Donaghy.) So you can imagine my fascination when my seat mate (let’s just call her SM), pretty much had nothing with her for entertainment–not a magazine, an iPod, an abacus…nothing. SM logged onto the plane’s WiFi but didn’t want to buy GoGo from Delta, so she just perused the sites advertising on delta.com. After looking at every Guess item on gilt.com (I’m not that nosy–this took over an hour…very methodical), she gave up on the computer and shut it down. SM then moved on to the Delta magazine, flipping through it in an agitated manner a few times. She then went back to the emergency exit overview before remembering she had her phone with her. Unfortunately, it wasn’t a smartphone, so it was rendered useless pretty quickly. At this point I was almost giddy as I awaited her next move (“Is this what Jane Goodall felt like with her binoculars?” I asked myself). Unfortunately, it was to nap for the duration of the flight so that was rather anticlimactic. I’m sure Jane could empathize.